Little James Brown, under jockey Cesar Carillo, races to top qualifying mark in the QHRAI Stallion Service Auction Futurity trials at Indiana Downs. SHELBYVILLE, IN�AUGUST 10, 2013�Little James Brown and Secrets Fly raced to the top qualifying times for the rich QHRAI Stallion Service Auction Futurity on Saturday at Indiana Downs. The 10 fastest qualifiers to the QHRAI Stallion Service Auction Futurity will return on Saturday, August 24 to vie for the winner's share of a $100,000-added purse going 350 yards. Little James Brown, owned-and-trained by Randy Smith took a quick lead in the first of six trials and went unchallenged to win by 1 � lengths to post the top qualifying time of :17.888 seconds for the QHRAI Stallion Service Auction Futurity . Cesar Carillo rode the IVORY JAMES gelding, out of Fredas Title by Title Contender, to his second win in five starts. Preston and Karen Cloud bred the brown gelding, who has also finished second twice, in Oklahoma. Shipping in from Louisiana, Old South Futurity winner Secrets Fly was equally impressive with a 1 � length win in the final trial for owner Cynthia Allen and trainer Ron Raper. The NO SECRETS HERE gelding covered the 350 yards in :18.027 fo the second fastest clocking. 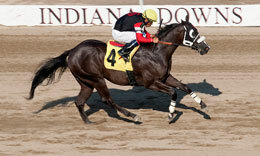 Juan Guerrero was aboard the Oklahoma-bred from the Strawfly Special mare One Upon A Fly. Joevetta Meredith bred the four-time winner of more than $57,000. For the complete list of QHRAI Stallion Service Auction Futurity qualifiers, times, sires, dams, owners, breeders and trainers CLICK HERE.